The one name that instantly crops up in our mind when we talk about tattoo artistry is, the great ‘Sailor Jerry’. Born as Norman Keith Collins on January 14, 1911, Jerry was an eminent figure in the world of tattoo artists. The fact that he was extensively involved with tattooing sailors resulted in Collins earning the moniker ‘Sailor Jerry’. You simply know it when a legend is born, and the life of Sailor Jerry was far from ordinary. A roughneck with a keen eye for detail, Sailor Jerry spent his life growing up in the beautiful foothills of California to maneuvering around the gangster streets of Chicago and sailing across the enigmatic expanse of the China Sea up to Asia, before finally settling down his roots in the beautiful islands of Hawaii. It is then that through his modest tattoo studio in Chinatown, Honolulu, Sailor Jerry breathed life into his exotic American folk designs and redefined the art of tattooing forever. Born in Reno, Collins was brought up in North California. His interest in tattooing was noticeable from a tender age when he learned the primitive 'hand pricking' tattooing method from an Alaskan man named Big Mike. At the early age of 9, Collins learned the use of a proper tattoo machine from Tatts Thomas of Chicago. For regular practice, his clients mainly included the homeless drunkards brought into the city from Skid Row, who let him tattoo them in exchange for a few cents or cheap wine. Once an adult, the hunger to learn more and spread out his wings brought Collins sailing across the Pacific Ocean to Hawaii. After getting enlisted in the United States Navy at the age of 19, Collins developed a strong fascination for the Eastern art and philosophy, nuances of which are largely conspicuous in his artwork. After settling down in Hawaii, Collins took up a job as a skipper for conducting sea tours of the islands and worked as a tattoo artist on the side. Apart from tattooing, Collins was also quite passionate about playing the saxophone in a private dance band where he was known as Old Ironsides. Through his inherent zeal and passion for leading an existence of his own accord, Sailor Jerry defied all norms and left the comforts of his home as a teenager to bypass his American Dream, traveling by train hopping and hitch hiking. While a majority of the youth in his time took the step driven by necessity and hardships, for Sailor Jerry, it was in pursuit of his dreams that were far bigger than his life at home. 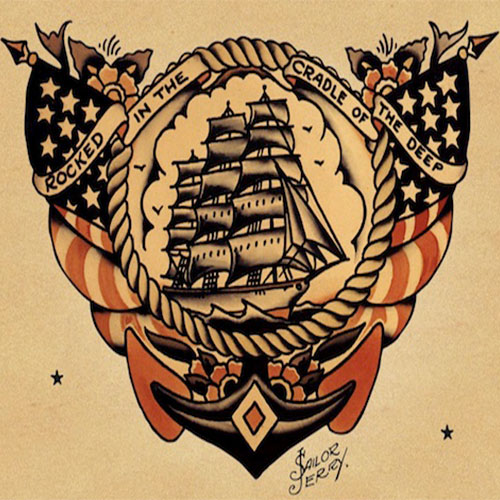 Traveling by freight trains, camping along the way and using his free time in learning the craft of tattooing was life for young Sailor Jerry until he eventually landed in Chicago. After serving his time in the US Navy, Sailor Jerry migrated to Honolulu, the place that changed his life forever. 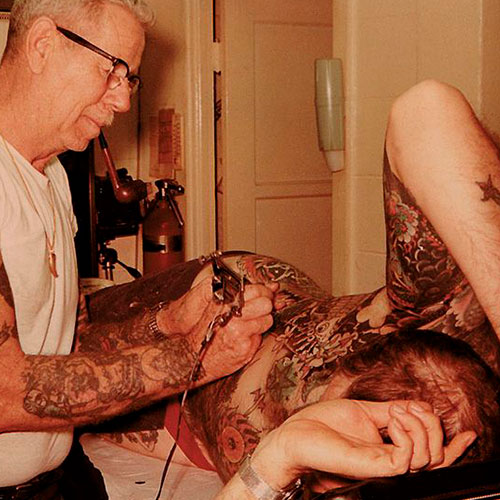 In the wake of the World War 2, a major chunk of the American men who were now serving in the military was led into the shady world of tattoo parlors, brothels and bars in neighborhoods such as the Honolulu Hotel Street where Sailor Jerry first showcased his flair for bold and novel tattoo ideas. The World War 2 served as an equalizer for men of different strata of the society, who while on shore leave lined up for drinks and women in the murkiest of city areas and got themselves tattooed as well. As cringe-worthy as the Hotel Street might have been, there was an elemental truth within the heart of the neighborhood. 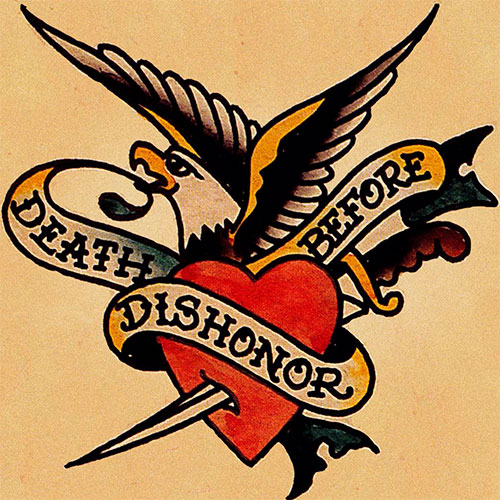 From the distressing bloody heart in Death before Dishonor to the wily vixen with the cocktail glass in the Man’s Ruin, Sailor Jerry’s artwork dealt with the harsh reality of life and showcased it with an artistic twist. 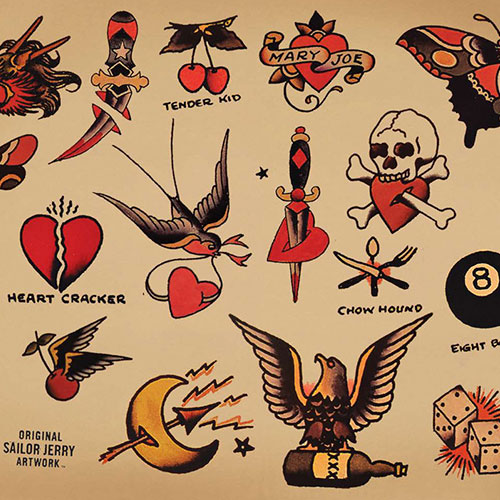 It goes without saying that war is a sensitive time that makes you ponder over the worth of human existence, and this is where Sailor Jerry’s sharp and bold tattoo designs ended up so compelling. It captivated the hearts and minds of all who gazed upon them. In fact, his tattoo designs are still looked at with awe and respect. With the kind of attitude and sincerity that Sailor Jerry brought to his work, it is essential to say that his art was not merely a fad thing for the bad guys, but a vessel of self-expression for people who were working for a greater cause. The tattoos depicted the mental and emotional scars of Americans who lived and fought for their freedom in the battlefield. Needless to say, Sailor Jerry’s major inspiration came from a culture that brought the world to the battlegrounds, the Japanese. The most sophisticated and advanced Japanese tattoo masters were known as the Horis. Determined to bring a fresh wave of artistry in the world of tattooing by fusing the Western and Asian concepts, Sailor Jerry became the first Westerner to follow through with regular correspondence with the Horis and learn the intricacies of tattoo tracings and other techniques. A pioneer of his work, Sailor Jerry was constantly perturbed by ripoff artists who were unoriginal and blatantly copied his tattoo designs. His cutting edge techniques for creating incredible needle formations for minimum damage to the skin, developing harmless pigments, and his keen eye for detailing are a testament to his devotion to the craft of tattooing. 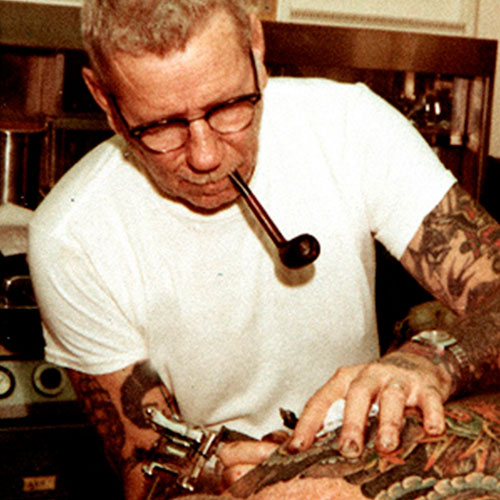 One of the first tattoo artists to employ the use of disposable needles and incorporate autoclaving for sterilization, Sailor Jerry transformed the entire concept of tattoo artistry to what we see as of today. To commemorate his unfathomable contribution to the world of tattoo designing, an event called ‘Sailor Jerry Festival', is held annually in Hawaii, which reminds us of Sailor Jerry’s legacy that lives on in our hearts long after he bid the world.